Amid a terrible week for journalism, The New York Times has confirmed David Carr, the newspaper’s media critic, has died. Carr was a critical voice in the journalism landscape, one that cut across medium and media offering candid, and sometimes harsh, takes on the latest, greatest and worst that our discipline generates. While the details of his death have not been confirmed, one fact is known: David Carr collapsed in The New York Times newsroom before being rushed to St. Luke’s-Roosevelt Hospital. For the many readers who awaited his byline each week, it is small consolation to know he left us doing what he (and we) loved most. The book traces the development of United States policy in the fight against terrorism, taking the reader from the first confused moments of that Tuesday morning, to the orchestrated strike against Osama bin Laden’s fortified compound in Abbottabad, Pakistan which took the Al Qaeda leader’s life. 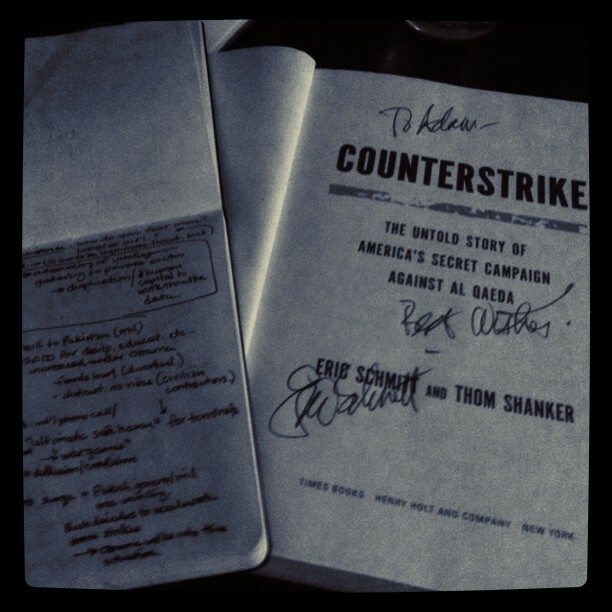 Eric Schmitt’s signature graces the inside cover of Counterstrike, a 2011 publication with New York Times colleague Thom Shanker. “We need to be lucky and good everyday,” said Thom Shanker, a reporter for the New York Times. Even though the United States hasn’t had a terrorist attack in 10 years, doesn’t mean we’ll be safe forever. Mr. Shanker and co-author Eric Schmitt, also from the New York Times’ Washington bureau, discussed their book, Counterstrike: The Untold Story of America’s Secret Campaign Against Al Qaeda, at the New York Society for Ethical Culture in Midtown Manhattan on Monday September 12, 2011 – one day removed from the 10th anniversary memorial ceremony of the Sept. 11 attack. While the book contains insider notes on the workings and workers of the American intelligence and security community, it also paints a stark picture of U.S. preparedness on September 11. “There were people in the Pentagon who were asking ‘al Who’?” said Mr. Shanker, who was shocked that state officials were unaware of Al Qaeda in the aftermath of the 9-11 attack. This fact is made worse given that Al Qaeda claimed responsibility for the 1993 bombing of the World Trade Center. Mr. Schmitt and Mr. Shanker also discussed the propensity for President George Bush’s “capture of kill” anti-terrorism strategy to feed Al Qaeda recruiting networks, citing concerns expressed by then-Defense Secretary Donald Rumsfeld that the US approach was increasing, not reducing, the ranks in terrorist organizations. In response, the authors argued that a new deterrence strategy took form in 2003-2004 which focused on attacking what terrorists hold dear – issues of reputation, financial restitution and the security of terrorist networks. To deter terrorists Shanker and Schmitt said that the new strategy demanded spreading responsibility across the government more broadly, while simultaneously stressing inter-operabililty between intelligence (and I.T.) frameworks, transparency amongst government branches and cooperation between sectors of the national security apparatus – most noticeably the CIA and the FBI. The night’s more animated conversation and debate surrounded warrantless wire-tapping which prompted questions on liberty and security. However, this line of questioning led the Timesmen to recite persuasive evasions, instead of measured answers. However, Mr. Schmitt and Mr. Shanker did highlight technology as both a progenitor and salve of modern terrorism. “The Internet is the ultimate safe haven for terrorism,” said Mr. Schmitt, as websites or forums provide the space for extremists to indoctrinate others, while the Internet’s online gaming communities, replete with its anonymous and atomized user experience, are penetrated by terrorists transmitting coded information without detection. The Internet also provides an opportunity for law enforcement to lay in wait for extremists to expose themselves, leading to identification and potential capture. In writing this book, Mr. Shanker and Mr. Schmitt said they intended bring the challenges of anti-terrorism policy and practice into relief. It isn’t easy to quell the fires of extremism, but Mr. Schmitt admits that it is possible over time. One method is attacking the narrative used by terrorist organizations. “The United States struggles with the ‘say-do’ gap,” said Mr. Shanker. By this, Mr. Shanker means that regardless of national security concerns which necessitate the presence of American troops abroad, their deployment – almost exclusively – in regions like Afghanistan, Somalia, Iraq, and Libya makes them vulnerable to Al Qaeda’s argument: the West has waged war against Islam. “The American narrative is hard to defend,” said Mr. Shanker. Finally, as the discussion opened up to audience questions, Mr. Shanker’s expertise on the Washingston/Pentagon beat was put to use in the discussion of new Defense Secretary, Leon Panetta. Mr. Shanker reminded the audience that former Defense Secretary Robert Gates was selected to deal with Iraq, and stayed on to handle Afghanistan. Mr. Panetta, however, will have to wage war with the budget, said Mr. Shanker. In the night’s final response, the Times’ reporters took delicate jabs at the state of U.S. politics. “Washington can’t take two big ideas at the same time,” said Mr. Schmitt. Unfortunately, and as Counterstrike demonstrates, the ‘big ideas’ do not have simple solutions. Particularly when national security is the subject of debate.